After Milwaukee (my first full marathon, last Oct.) I took 2 full rest days off before getting back on the road for my first post-race recovery run. This time around I took 3 full days off. Wow, what a profound difference in recovery experiences! Though I will also chalk this up to better training and higher mileage for Bayshore. I spent the first half of Milwaukee babying a bum right knee and had to reduce my mileage, as a result. This time around my body was better prepared for the effort (even though my race time wouldn't suggest such--but that was my own damned fault for going out too fast and crashing-and-burning 2/3 of the way in). For a solid 4+ weeks after Milwaukee my runs pretty much stunk. They were stiff, painful, slow, miserable...yuck. I have now logged 3 recovery runs since Bayshore and they all have been good runs...last night's run downright rocked! My trail run 2 days ago was a little rough, but still not bad. Mostly my legs just felt stiff and my energy level was on the low side. But I could have a run like that totally at random, too. The worst part about that run was really the damned mosquitos. Wow, I have never ever seen them this bad. But there are a LOT of standing water marshy areas in and around the state park in which my friend and I ran. Mosquitos were literally swarming...like flies! We couldn't stop to stretch for even a couple of seconds...they were all around us like a cloud of high-pitched grayness. Back to Bayshore...next year's date is already up - May 29...so a week later than this year (Memorial Day weekend must be a week later, too). I plan to register the day that registration opens in Dec. I think nearly all of the RunningAHEAD.com peeps who were there this year are planning to return, as well. One of the guys is even talking about renting a cottage for a week, so we will have a place to land after the race...for beer and food and fun without having to sit in a crowded restaurant that doesn't lend itself well to a large group. Less than 2 weeks 'til the big trail relay. I won't likely be able to do that race next year, as it will only be 2 weeks after Bayshore -- but I will be able to do the Riverbank Run 25k again, as that will be 3 weeks prior to Bayshore in '10 (this year it was only 2 weeks before...too close to race day to be considering any sort of 15.5 mile race efforts). My best friend and I are already talking about running that race, then adding the remaining 4.5 miles as easy ones before and after the race...and counting that as our last long 20 miler before tapering in preparation for Bayshore '10. It will be kind of nice to combine a big race and a long marathon training run in one. I like that sort of multi-tasking. that is an awesome race finish photo! Yeah, it's definitely one of my better running photos. I'll be interested to see what the official shots look like. 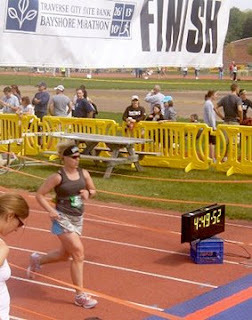 I think the race photographer was just behind the finish line, so that photo should be straight-on. I'm sure your official shots will be great!